The proprietary Poly C used in the Booster C 600 blend has been shown to provide higher levels of vitamin C over a longer period of time. 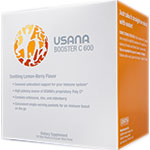 USANA Booster C 600 is also the perfect seasonal companion to USANA’s other supplements that support immunity health: Proflavanol® C100, USANA®Probiotic, Pure Rest™, and USANA’s Vitamin D supplement. Because of the potent immune boosting ingredients that Booster C 600 provides, it should NOT be taken longer than two weeks at a time. It is the perfect solution just for those times when you feel your immunity needs a little boost.